OCTOBER 2017 THE SHOP 67 RESTYLING/AFTERMARKET ACCESSORIES We are very careful when ordering these setups for a customer—it is always best to get every choice for each option in writing and signed by the client, because they become $1,500-plus mistakes if some- thing isn't right. It's always best to do your homework and never shoot from the hip when a customer has questions or concerns. Investing in fiberglass lids is getting harder for many shops and customers to justify, because of all the great ABS ton- neau cover models now available. With the ABS plastic models available painted or unpainted and ready to go, fewer clients want to wait two or three weeks for a fin- ished fiberglass product. The bigger caps are also more difficult to take off and put back on, because they are heavier than ABS. I prefer the ABS option when it makes sense, again mainly because of the ordering process. We sell many more ABS prod- ucts than we do fiberglass, and I think it's because in today's fast-paced, instant- satisfaction society, customers want what's in stock or can be ordered and delivered in a few days. In the end, it's all about what the cus- tomers driving these trucks want, and the history of these products shows us that when the customer wants something a little better to solve a problem, aftermarket man- ufacturers will come through with flying colors to give them what they need. As long as trucks continue to serve as pre- ferred everyday driving vehicles for families and professionals, then the tonneau/cap/lid market should continue to stay strong— even as it continually conforms to new market demands. JOSH POULSON is the principal of Auto Additions in Columbus, O h i o , w h i c h wa s n a m e d Restyler of the Year, 2012- 2013. Auto Additions offers a complete line of product upgrades, including 12-volt and appearance packages with a specific focus on the dealer- ship segment. Josh currently serves on the SEMA PRO council and was named 2015- 2016 "Person of the Year" at the 2015 SEMA Show. Customers often come in looking for a basic tonneau option and end up leaving with a more expensive model that offers all the features they desire. 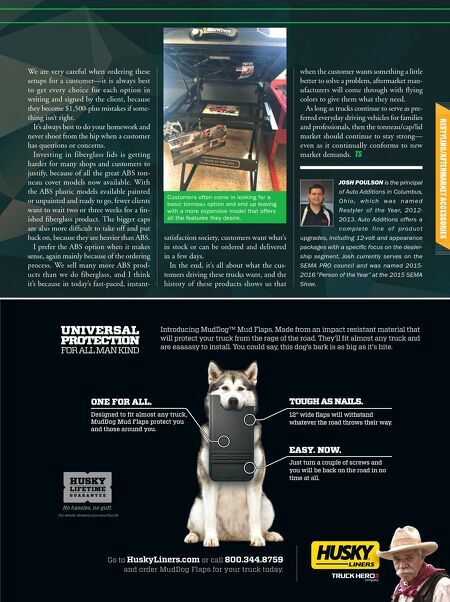 Go to HuskyLiners.com or call 800.344.8759 and order MudDog Flaps for your truck today. Introducing MudDog™ Mud Flaps. Made from an impact resistant material that will protect your truck from the rage of the road. They'll fit almost any truck and are eaaaasy to install. You could say, this dog's bark is as big as it's bite. 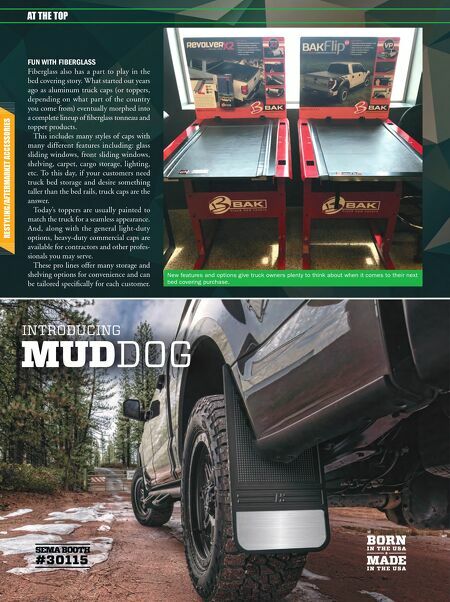 UNIVERSAL PROTECTION FOR ALL MAN KIND Designed to fit almost any truck, MudDog Mud Flaps protect you and those around you. ONE FOR ALL. Just turn a couple of screws and you will be back on the road in no time at all. EASY. NOW. 12" wide flaps will withstand whatever the road throws their way. TOUGH AS NAILS.